Jason: Greg, it’s always a pleasure to have you back. Greg: All right, so I think if I remember correctly, last week we were talking about master bathrooms and I kept trying to ask you if the master bathroom and master closet were kind of the same room. You said they’re not. We’re coming back for another week and let’s talk about closets if that’s all right. Jason: Yeah. People, as much as they love their master bath, they really enjoy their master closet and the way it’s laid out is very important. You can’t just put wire shelving and call it a day anymore. Greg: That’s right. This is a little bit on topic, but it’s a little bit odd that just this last week, I ran into someone who said that they could not move because they’d miss their master closet. That was their number one reason they couldn’t move from their current house. I need to go see this person’s master closet bu,t what are you seeing that is making people so attached to master closets that you hear that comment every once in a while. That that’s my room in the house. I wouldn’t move if I don’t have a closet like this. Jason: Right. Well, being a luxury custom home builder, like Artisan is, we’re building a higher end product and master closet the expectation nowadays is obviously there’s no wire. We’ll do versions. We can do a built-in with our trim carpenter that is all wood. We can customize it to the size and shape of the closet. We can meet the customer’s demand. I like doing the customized closet system like that, with the trim guys because we’ll paint it to match all the woodwork and the rest of the house and it just … It gives a seamless look and we can do … A lot of people are going away from dressers and drawers in their master bedrooms, so we’ll usually have some type of drawer stack or even a center island is very important to the ladies to put their jewelry in and you know, just have a place to get staged for the next morning. Greg: When you’re saying that as a luxury builder people have certain expectations for the master closet, are we talking, is it the space that you’re using so that it’s much bigger and more … It’s like grandeur space? Are you talking about the finishes, like you just mentioned, the artist, literally artist, creating the actual components of the closet. The drawers and all the shelving. Is it a combo? Jason: It is because we’re building a lot of homes in Norton Common, space is at a premium, so we have a lot of luxury master closets that aren’t necessarily huge. It’s important that they’re laid out properly so we may take them up a little bit taller, maybe into the ceiling. Being in Kentucky and Derby, a lot of people have derby hats. Greg: I know where you’re going. Right. Jason: We’ll put those on some taller shelves that you may only access once or twice a year. You may need a step ladder with 10 foot ceilings as our standard ceiling height. It gets a little bit tall, but again it gets that stuff up off the ground which is nice for those delicate hats and fascinators. Greg: You can have a luxury closet without taking up a huge amount of the whole house. It’s a combination of using the space well and the finish level. Jason: Well, and that’s where the organizational piece comes in handy. Where you want somebody helping you lay out that closet that has done it before and can really maximize the space. Usually, we’ll talk to the specific clients and find out, you know, how many pairs of shoes do they have, how many pairs of boots do they have. Do they have a big tie collection or belt collection. We want to make sure that when we design this closet that we have the right space for the stuff that the clients have. Greg: You’re not judging right? You don’t ask how many shoes they have to judge them. You just need to know as a builder right so that they’re properly taken care of in the closet. Jason: Yeah, most men start rolling their eyes at this stage. Although, we have quite a few men that actually dominate the closet. Greg: That have quite the collection? Greg: There we go. Why not. Are these components? How does a buyer know exactly what they’re looking for? Do you say, “Here are twenty different kind of components,” like a shoe rack or a tie belt you were talking about or I guess the hanging clothes are different sizes for men and women. Dress versus blazers. Who drives that? What kind of components go into a closet? Jason: A lot of it we can do built in with some accessories. If we get real fancy, we’ll get a company like Closet Factory or Closets By Design that that’s all they do is specialize in closets. If you need tie racks and belt racks, we did a very nice high end look in our Bellarmine designer show house this year that Closet Factory did. We had doors and doors and we actually had lighted rods. It was LED lights that you push the little button in. All your rods lit up to highlight the clothing. Jason: It had other things like sliding doors that could keep your shoes behind there and a lot of people like a staging rod so they could get their outfit all picked out for the next day and they’ll pull a little rod out and have it pre-hung. As the next morning arises, boom. There they have their clothes ready to go and they don’t have to think about it. Greg: Some of these things you’re mentioning I’ve never even heard of or thought of in a closet. How does someone who is building a house … How do they make sure that they’re aware of all the options to choose what’s right for them? 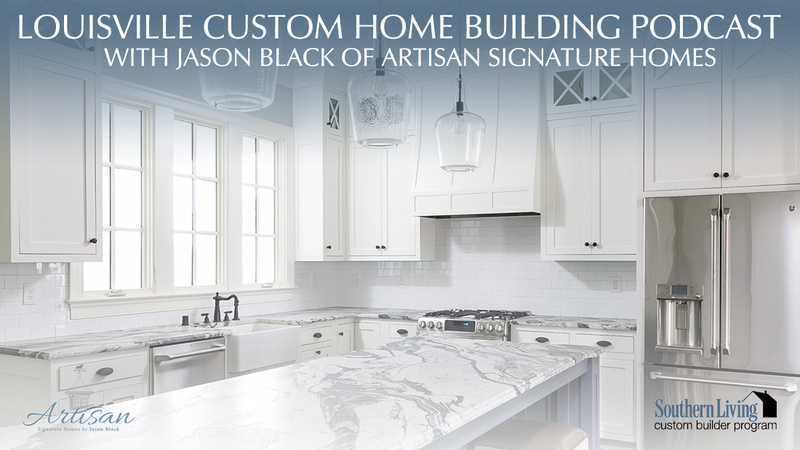 Jason: Well that’s why they choose a quality builder like Artisan. We’ve been down that road before and we’ve built several hundred custom homes for buyers and we don’t always know what they want, but we will ask them the questions to understand how they live in their home and you know what type of clothing they have. We can tailor the design based on their needs. It’s kind of like what we do with the house. It’s just a subset of the overall house like we do with the kitchen, we’re going to do the same thing with the closet. We’ll ask them to write questions and make sure when they build this million dollar home that they have a functional closet that they love. Greg: Right. I guess I have two questions. I’d like to hear more about some of the bigger grandeur closets that are in some of the bigger homes. Maybe not in Norton Commons, if that doesn’t fit. Also, where are people putting their closets now? Is it something that you walk through to get to the bathroom? The master bathroom we talked about last week? Do I have that backwards? Is there a rhyme or a reason or is it really independent, or up to each individual buyer? Jason: You know, most of our clients like the closet off the bathroom or off a hallway. You could have a little vestibule off the master bedroom to where when you go to the vestibule you could go to the right to the master bath and you go left to the master closet. The whole idea is if you have a husband or wife that gets up earlier than the other, they can go in, close the door, they can shower, take a bath, get their clothes, they can get ready all in one space. They don’t have to be coming and going through the bedroom. I think it’s very important that the closet is separate from the bedroom, but yet connected to the bathroom. A lot of times, there’s one large closet. Again, very client driven. Some people are like, “Well, you know, my husband’s a slob or my wife’s a slob. I want my own space.” We do probably fifty-fifty of his and her closets and then large closets. Greg: Okay. Walk me through some of the bigger closets. I’ve been to a couple of Homearamas and some of them it seems like a … I don’t know if a couch is the right word, but there’s sort of a casual seating area in some of the larger closets. Jason: Absolutely. We do a lot of window benches just to get some natural light in. Flooring is usually hardwood. Some people like carpet in there, just for a little bit softer touch under their feet. We’ll do a lot of chandeliers in the woman’s closets so maybe that’s over a central island so it just has a more glitzy glamour feeling so it’s not your traditional closet. You know, there’s always some type of a, like I mentioned, a bench or a place for a chair. I have a lot of people that the husband may want a chair in the woman’s closet while she’s getting ready to have some conversation. Greg: These are just generalizations right? You’re happy to do any combination of small closet, big closet, his closet, her closet. Whatever works for a buyer I’m sure. Jason: That’s right. We’ve done some, you know, we are here to please. Greg: I’m sure you’ve seen it all, that’s right. Jason: We have. We’ve done some two story closets to where if space is limited or somebody just wants to keep all their stuff in one spot, we can go up a little spiral staircase and you can have your fall wardrobe or winter wardrobe up at a different level that once it’s spring time you can switch them out or you can go up the staircase. Greg: That sounds great. That sounds interesting. I know in a couple of months you’ll have a home open or a couple of months after that you’ll have a couple homes open in the Homearama and the Southern Living showcase. Can you give us a preview of what kind of closets we might see in one or two of those homes? Jason: Yeah. We are going to have some great closets. We’ll feature a lot of the items we talked about with the built in island is going to make an appearance in one of those showcase homes. Chandeliers will be in there. One thing we didn’t touch on is people like a little sound coming through the audio system in the closet. Yeah, come back and check those showcase houses out and you’ll really get to see in person what we’ve been talking about all these weeks. Greg: That sounds great. I’m looking forward to it. Thanks again for having me out. Jason: All right thanks Greg. Have a good one.